Space is a big place, but Earth's orbit is smaller and getting increasingly crowded. More than 100 million bits of rocket and old satellite are zooming around our planet at high speeds, posing a threat to current and future spacecraft. A number of plans to clear out some of that space junk have been proposed over the years. One, from the Japanese Space Agency (JAXA) calls for an electrodynamic "tether" to be dragged behind a spaceship, which would slow down space junk. The idea is that the decades-old trash, once slowed, would fall back into the Earth's atmosphere and burn up harmlessly on reentry. To test the theory, JAXA tapped a fishing net company to build a 700-metre-long tether out of steel and aluminium and attached it to a cargo vessel. The craft launched in December, carrying supplies to the International Space Station. But JAXA now says that something went wrong and it's not sure if the tether successfully deployed or not. The agency says it's working on the problem. But time is ticking. The engineers have until the weekend to solve it before the cargo ship itself burns up in the atmosphere. 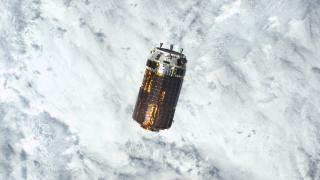 This is Japan's third major space failure in the past year. In 2016, the company lost contact with a $270 million X-ray hunting satellite, and last week another craft splashed into the ocean after failing to reach orbit.